If you have a large collection of pictures, photos and images on your computer, chance is that some of them are broken or defective. This can be due to transfer errors or storage device issues among other things. While most users won't mind having a few broken images sitting on their hard drive, others may want to find the broken images to delete or move them. This can for instance be handy if they regularly watch image slideshows on their computer, as broken images might return error messages, break the slideshow or return an empty screen. 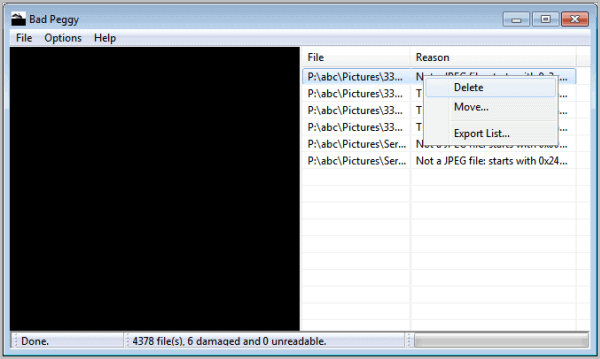 Bad Peggy is a Java application that can be used to scan a folder for broken or defect jpeg images. The program will automatically scan all jpg compatible image formats in the root folder and all of its sub-folders. You select the root folder with a click on File > Scan or the keyboard shortcut Ctrl-s. The program will then scan all jpg files in the folder structure. All broken or defective images are listed with their file name, path and reason why they have been added to the listing. This can be the reason if a file is not a jpg image but has the jpg extension, or if it is a truncated file. Images can be selected with the left mouse button. The program tries to display a preview of the image on the left side of the screen. This works well for some types of errors, for instance if the file is truncated, which often is caused by a transfer error. Other jpg images may show a blank screen instead. A right-click opens a context menu with options to delete or move the file. It is additionally possible to export the list of damaged jpg images. Additional file types to scan can be added via Options > File Extensions. The application cannot scan large jpg images. It displayed error messages when I tried to scan a folder containing digital camera image with a size of three and more Megabytes. Bad Peggy is compatible with the Windows and Linux operating system. The software can be downloaded from the developer website. This is some thing I have to do more research into, thank you for the publish. That’s an awesome tool for batching. That would come in helpful if you had an API and could be used in the batch uploading for a site like http://stockfuel.com. Oh, no. I just need this utility but I dislike Java. Does anybody know an alternative tool for scanning JPEGs? Why on earth would anyone dislike Java?